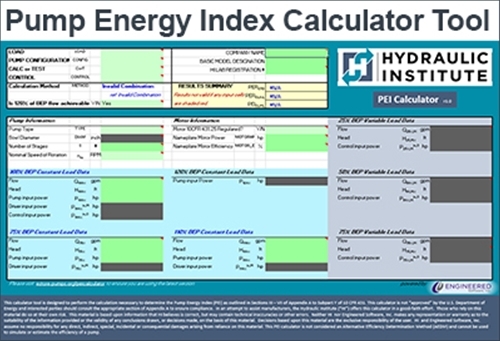 Calculator Tool Overview: As part of HI's Energy Rating (ER) Label Program HI, with support from member company Engineered Software Inc. (https://eng-software.com/), has developed a calculator tool to aid the public and its members in determining the Pump Energy Index (PEI) according to Department of Energy (DOE) Regulations. The calculator is a macro-enabled excel tool that is designed for manufacturers to use as part of their testing programs. The tool walks the user through the calculation process according to the section of the DOE test procedure the pump was tested to. Help text is provided explaining what each value means. For more information about this tool, please contact Pete Gaydon, Technical Director, Hydraulic Institute at pgaydon@pumps.org or by calling 973.267.9700 x1191. Version 1.1 corrected calculation errors present in previous versions, which applied to the calculation of PEI for pumps that could not be tested to 120% of BEP. DOWNLOAD NOTE: In the area above, simply click Add to Cart and click Checkout. Fill in the required personal information on the following page, then click 'Complete Order'. Upon completion of your order you will be presented with a copy of your order which will include a download link. Simply click on the icon to download the calculator. At any time after you have placed your order you can access the download link through the My Account > Digital Goods menu. You will not be charged for this HI member-only tool. Having an issue? Please contact Pete Gaydon, Technical Director, Hydraulic Institute at pgaydon@pumps.org or by calling 973.267.9700 x1191.